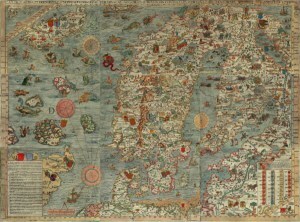 Image: The Carta Marina (1539) by Olaus Magnus. A four day ocean seminar hosted by Røst AiR, where artists and scientists speak about their research and work which is directly connected to the ocean in one way or another. From the perspective of nature science, political science and a variety of artistic methods and expressions. From Ensayo#4 Randi Nygård was contributing with a presentation about her work and the upcoming book Wild Living Marine Resources Belong to Society as a Whole, and Søssa Jørgensen showed her performance video Ættesang / Song of Kin for the Gold of the Ocean. There are several reasons why Røst AiR wish to engage in a multidisciplinary gathering to exchange work and knowledge concerning the ocean and it´s marine ecology. With our location on the island Skomvær, surrounded by the North Atlantic sea, it is hard to overlook. The world’s largest known deep water coral reef is located in the Røst archipelago and is among the richest habitats we have. Røst is also home to one of Northern Europe’s largest pelagic seabird colonies situated in the Nykan nature reserve. However the seabird populations are in a crisis and have been struggling along since the Atlantic Herring population collapsed in the 60´ies. Pollution, badly managed fisheries, and climate change are all impacting the seabirds current situation, both here on Røst and in the far away places they spend their winters. And as the story goes with most other circumpolar seabird colonies, year after year with decline in population, colonies and eventually bird mountains become silent. To take one example, Vedøya, Europes most extravagant and lively birds mountains, had in 1980, after years of decline, still an impressive breeding colony of 22000 pairs of Kittiwakes and 12000 pairs of Guillemots, as well as numerous Puffins and Razor Bills. in the spring of 2017, it is empty. This is climate change in practice, and the air mirrors the sea. The Røst archipelago is also situated amidst a grand economic and geopolitical battle which concerns the oil drilling in Lofoten, Vesterålen and Senja and the struggle to end the Norwegian oil age. Røst AiR is an artist run AIR initiative and communal workshops, founded in 2012. Since the summer of 2013 members of the Røst AIR working group and our guest artists have lived out with this wild landscape on the island of Skomvær and it´s 150 year old lighthouse station. Every summer we have invited different scientists to join us to share their work with us so that we slowly build up our knowledge about the ecosystem surrounding us, and how we can gradually learn to live more sustainable. Being out in this grand, open landscape, one learns to understand how vulnerable it actually is. They say we know more about the surface of the moon than of our deep oceans. So we invite you to join us this summer at Røst for a four day ocean seminar, where artists and scientists will speak about their research and work which is directly connected to the ocean in one way or another. From the perspective of nature science, political science and a variety of artistic methods and expressions. “The Mysteries of the Sea” by marine biologist Henning Røed and Marie Kaada Hovden. “The air mirrors the sea” By Tycho Anker-Nilssen, Biologist specialised on seabird ecology. Curator and producer: Marie Kaada Hovden. With curatorial input from: Elin Már Øyen Viser, Berit Kristoffersen, and Eva Bakkeslett. Thanks to Jason Rosenberg and Cal Harben.